There was much discussion, debate and frustration over our decision not to release report #48. We published an article regarding that situation and can be reviewed if the readers are not familiar with it. It should be noted that any reference to members of the Shadow Government would not be accurate unless at least one Skull and Bones man (John Kerry) is mentioned. The above reference was innocuous enough but to us it did get our attention. 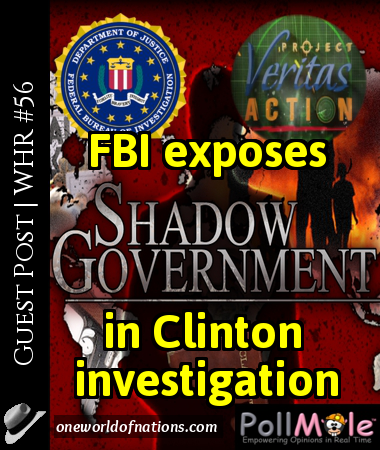 Further, it is not surprising that HRC is linked to the Shadow Government by an FBI agent. The Ministry of Propaganda (AKA the mainstream media) has, predictably, failed to mention this part of the FBI’s data dump, concentrating instead on the “quid pro quo” passage we mentioned in our last report. For an example of the Shadow Government’s total control, see our comprehensive report released over 4 years ago regarding the $15T SWIFTS sent via the banking system to Pureheart Investments, LTD. (Operated and controlled by one of the original members of the Shadow Government’s 'Group of Five') The transfers were initiated by the NY Federal Reserve (always the centerpiece of any fraud perpetrated by the Federal Reserve) through the usual suspects of criminal banks , JP Morgan, RBS, HSBC, Citibank and Credit Suisse. This fraud would not be complete without the Department of Homeland Security providing their 'blessing' of this fraud by providing proper cover in the form of clearance codes for this transaction. One of the many topics mentioned by Trump in recent days has been the rigging of elections, a subject that PollMole’s CEO, Dr. Richard Davis, has talked about extensively during his many interviews. It’s amusing to watch the M.O.P. attempt to spin this and do what they always do, lie and deny that it exists. Anyone who is awake is aware of the long, documented history of election fraud in this country, dating all the way back to Lyndon Johnson’s stealing of a US Senate seat in 1948 to the Mob fixing the vote in Chicago for JFK in 1960 to the farce in Florida in 2000 that was ultimately decided by SCOTUS. To hear anyone, including the Liar-in-Chief himself, deny that this is an issue is so disingenuous, it displays the desperation that has set in three weeks before the election. The whole system is set up to be manipulated and it begins with the registration process through to the pre-election 'polls' to the election itself. Election night TV is filled with numbers but we never hear about how many dead people voted, how many people voted multiple times and how many illegal immigrants voted. It’s interesting to watch the M.O.P. spin Trump’s revelations about election fraud by stating his unspoken message to his base is that he’s lost the race and the talking heads conclude this will deter his supporters from coming out to vote for a lost cause. Talk about desperation, the M.O.P. shills are doing everything they can to convince voters from coming out in support of Trump. Or worse, they try to convince us that Trump knows all is lost and he’s already providing an 'excuse' why he won’t win the election. Why are the FBI And HS not arresting these Perps? How big is stealing a nation? How how about naming the parties blocked out in the Shadow Govt as they clearly are evading scrutiny. Why? Who authorised them? 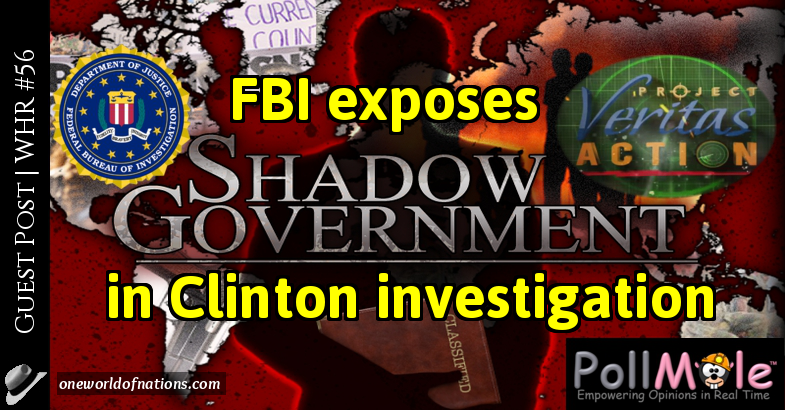 I would like to know the names of the blocked out Shadow Govt piece. Why did you block them? It was redacted by the FBI. If we could, we would show all the names.